A large part of creating quality, long lasting rain gutter solutions is choosing the best materials and products and installing them correctly. Our goal at Chimneys Plus is to combine well-hung high-quality gutters with superior gutter covers. We are committed to providing gutters using the best materials on the market and installing them with the most advanced techniques all designed to eliminate your gutter headaches. We provide all customers with an initial free estimate, examining the state of your current gutter system. We'll make recommendations based on our findings. The materials we use are guaranteed for 20 years. Our gutters are machined from the highest quality aluminum or copper, depending on your needs and are 20% thicker than most. We combine solid craftsmanship, quality installation, and the unbeatable leaf protection of our Gorilla Guard Gutter Guards for long-lasting rain gutter systems that are virtually maintenance free. Our standard aluminium gutters are 20% thicker than the industry standard. Drip edge protects the back edge of the gutter and keeps water from rotting out the fascia board. Drip edge should be installed after the gutters have been hung. Our skilled team of installers also craft custom miters on the job for strength, beauty, and performance at every corner and seam. We hang our gutters with heavy duty hidden hangers capable of supporting 260lbs each. All of the screws that we use while installing our gutters are stainless steel. We mount the downspout below the gutter, while the gutter interior remains smooth for maximum water flow out of each gutter. We offer two types of gutters, in High-Quality Aluminium orHigh-Gradee Copper gutters. We offer K-Style Seamless Gutters or Seamless 5in & 6in Half Round Style. We offer two types of gutters, in High-Quality Aluminum or High-Grade Copper gutters. We offer K-Style Seamless Gutters or Seamless 5in & 6in Half Round Style. Why do you recommend 3x4" downspouts? We recommend 3×4” downspouts because they have twice that inside area of 2×3” which makes them much less likely to clog. 3×4” downspouts also can handle twice the water volume which is very helpful in the heavy rains that we have in the summer. Whenever we install our Gorilla Guard gutter covers, we require 3×4” downspouts for these reasons. What is the proper slope for my gutters? We recommend that rain gutter installation should drop from the highest point to the lowest point at a rate of a quarter inch every 10’. This ensures that water fully drains out of the gutters after each rain and helps keep small bits of debris from lingering in the gutters. Yes, we do. We do not sell any particular brand of rain barrels but we are more than happy to connect your rain gutter system to any rain barrel that you choose. What is the best type of hanger to use to install gutters? There are two primary types of hangers in use today. The first type of hangers are called “spike and ferrule” hangers and involve a large nail or spike that is driven through the front of the gutter and into the house. While very strong, these hangers often lead to fascia rot and are also very hard to remove to adjust the gutter in any way. The second type of hangers are called “hidden hangers.” These are brackets that clip into the gutter and then are attached to the house with a screw. The advantage of these hangers is that they can be easily installed and adjusted. One downside of these hangers is that they are often not as strong as “nail and ferrule” hangers. In order to address this, we use Raytec Hangfast gutter hangers capable of holding and impressive 260lbs per hanger. If you need help with gutter installation, service or repair let us know using the contact form below and we will be glad to assist you. How many downspouts should my gutters have? On most homes, we recommend that you have one downspout for every 20’ – 30’ of gutter. In some situations, you can drain 40’ of installed rain gutter to one downspout, but we try to avoid this as much as possible in order to maintain optimal performance and functioning of your gutter system. No. While less expensive, vinyl gutters are also much less durable and often crack and break. We only install rain gutters made from heavy gauge aluminum, copper, and galvalume. Do gutters come with a warranty? The gutter materials we use have a twenty year warranty, however we can’t guarantee the performance of the gutters because they will clog without a gutter cover or gutter guard like Gorilla Guard. Will Gorilla Guard covers adversely affect the appearance of my house? Not at all! In fact, most people find that Gorilla Gutter Guard covers enhance the appearance of the house! Because of its low profile, it is much less visible than similar products. By blending the color with that of the shingle, Gorilla Guard covers can become nearly invisible to the casual observer. Another advantage to having Gorilla Guard covers installed is that it is a capital improvement that increases the value of the home while making the gutters maintenance free. What is a well hung gutter? We get a lot of questions about what we mean by “A Well Hung Gutter” so here are a few pointers. This geographic region is uniquely in need of working gutters because of the trees debris, our squishy clay soil and despite annual cries of drought it generally rains a lot here in North Carolina. Does not hold water – The rain gutter must be pitched toward the downspouts. This sounds ridiculously obvious but some major building companies specify minimally that no more than 1 inch of water is allowed to stand in the gutter. Standing water means leaky joints, drips, and rotting fascia boards. Has a full sized downspout outlet and downspouts. – Believe it or not, you can have a nice gutter but if the downspout is too small water will sit in the gutters unable to drain away. Downspouts and outlets should be 3×4 inches. Heavy duty hangers – If by some freak occurrence your gutters do clog and fill with water weak hangers can break, nails can pull loose and then gutters pull away from the house. Even a little bit of pulling away can mean trouble for your home. Has enough downspouts to handle the water runoff – The bigger the roof area directing water into your gutters the more downspout capacity you need. Other factors like roof pitch will affect the number of downspouts you need as well. Quality Miter joints – Whether it’s around a bay window or around the corner of your house, the more metal seams you have the more leaks you will have. 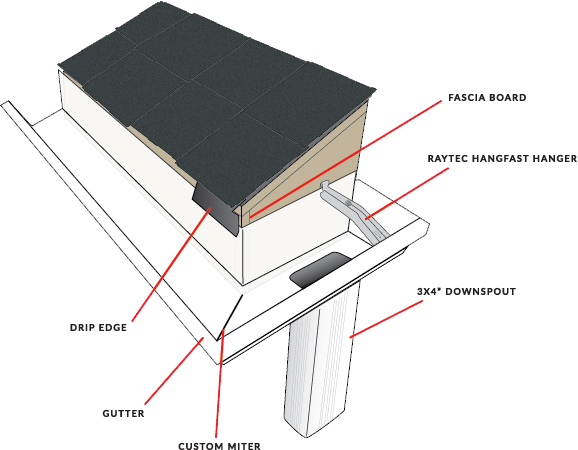 “Box-miter” joints found on most homes are leaks just waiting to happen. Maybe you never wonder about how your gutters are doing. Who wants to stand outside while it’s pouring rain to inspect them and if its not raining, who worries about their gutters? Don’t ignore some tall tale signs, they could lead to costly damage to your home. Worried that your gutters aren’t as well hung as they could be? Call us and we would be happy to come inspect your gutters and give you a free estimate on the best gutter solution to fit your home and budget.